From the discount store, I purchased a 4 ft length of bamboo and cut the stalk into three 16" pieces. 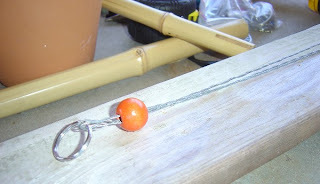 I also used my drill and a small drill bit (large enough for a doubled piece of 22 gauge galvanized steel wire to pass through), needle nose pliers and wire cutters, a sharpie pen, a small key ring, tape measure, a scrap piece of 2 x 4 wood for a drill pad and a few wooden beads. You can get a better idea of what I'm making by looking at this shot. 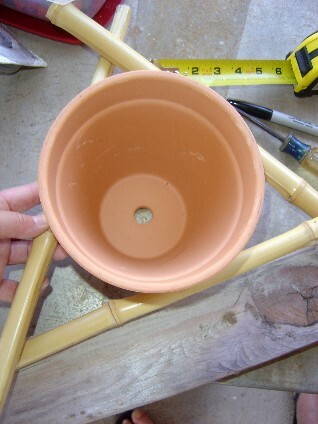 I took a 6" terra cotta flowerpot and "cradled" it by forming a triangular shape with the bamboo stalks overlapping at the ends. 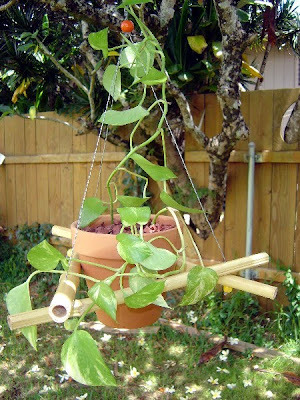 When complete, I'll have a secure, comfortable, "swing" in which the potted plant will rest. Using the initial assembly as a gauge, I made markings with the sharpie pen to indicate where my bamboo stalks will overlap and the placement of the holes to be drilled. 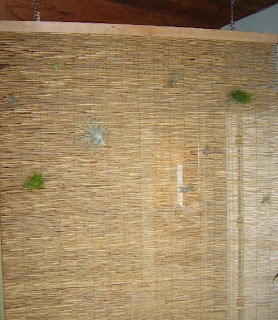 After the holes were drilled on each of the three overlapping edges, I snipped a small piece of the wire and laced together the holes of the top and bottom bamboo. Then I bent the wire ends over to form a temporary crutch. I made sure to alternate the stalks top to bottom for extra security. (Edit: I need to point out that in the pic below, the horizontal piece of bamboo in the pic should have the left end over the left stalk and the right end can remain where it is; I forgot to alternate these when making my temporary wire crutches, but the finished product is correct.) Blush....oops! To make the 22 gauge wire even stronger (and prettier), I twisted the wire. To do this, I cut three 40" lengths of wire. One at a time, fold each equally in half. Insert the folded end into the clamping portion (the chuck) of the power drill and tighten well. Secure the two loose ends of the wire between the 2x4 scrap and a clamp (look closely at picture above). 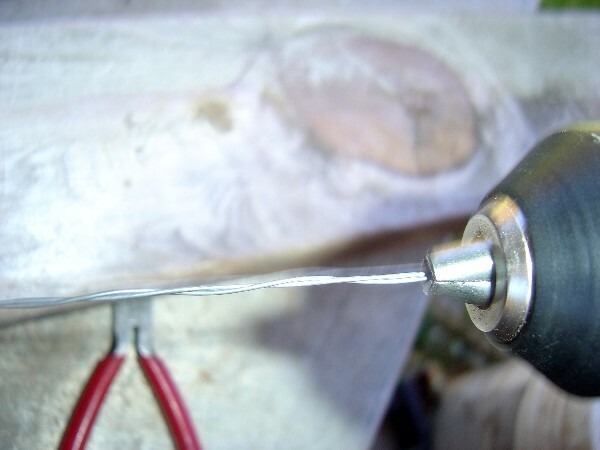 If you prefer or if you don't have a clamp, grip the two loose ends together very tightly with the pliers. I SLOWLY engaged the trigger on the drill clockwise until the wire is nicely twisted but not so tight that it would begin to curl up. I repeated this step two more times for the remaining wire lengths. I slipped the folded edges of the twisted wire lengths side by side over the key ring. 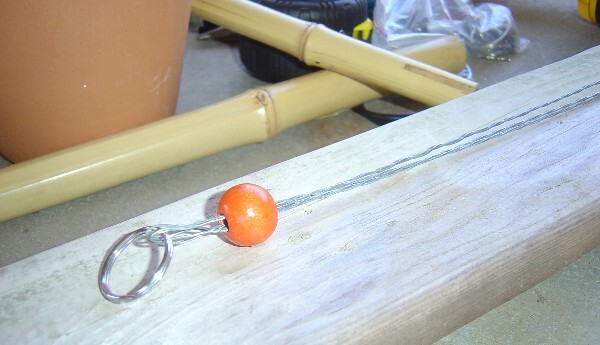 Then I strung an orange bead over all three wires jointly and pushed it near the top of the wire and close to the key ring. 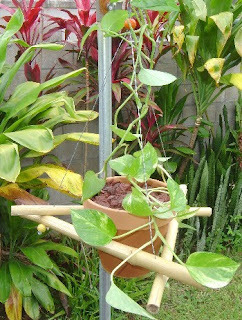 Next, I spread the wire ends into position and removing the temporary wire crutches one at a time, I strung the wires through the previously drilled holes of the bamboo plant hanger. 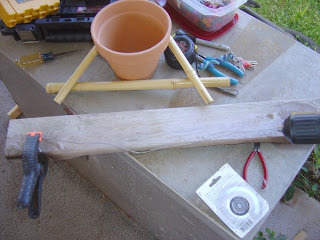 Once the wire was strung properly I used another wooden bead under each of the joined bamboo stalks. Look closely and you'll see the yellow bead on the left. Notice the wire has continued through this bead and the wire ends are coiled neatly. 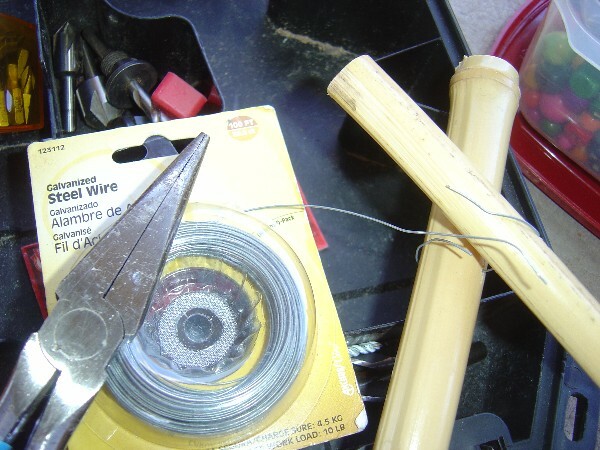 Be sure to make the coils large enough so the wire cannot slip back through the drilled holes in the bamboo stalks. You can adjust the lengths of the bamboo according to the size pot you're planning to use. Also keep in mind if you decide to go with a larger pot, the weight may require a stronger gauged wire. 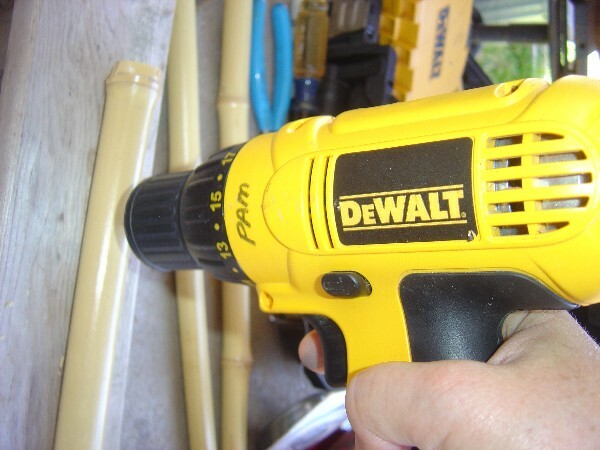 Yes, there are several steps to making this outdoor hanger, but once you've made one, you can whip them out really quickly. Hope you enjoy this project! 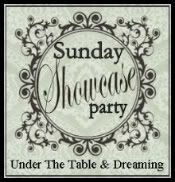 Hi Pam, I found this project over at Frugal Fabulous Design. When I got here, couldn't believe I wasn't already a follower....I fixed that problem! 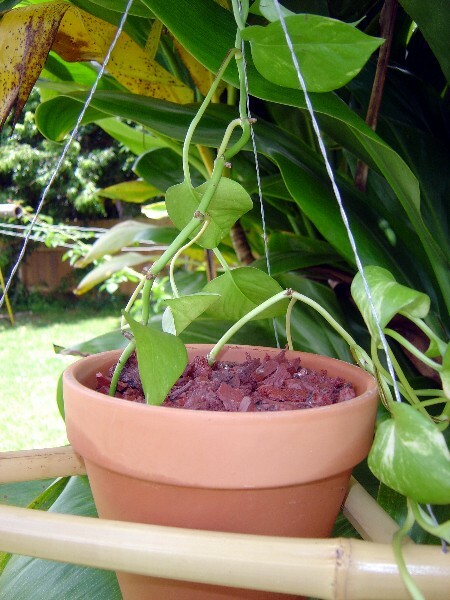 :-) Now I'd like to invite you and your bamboo plant hanger to my Garden party! It starts next Wednesday at Keen Inspirations and is ope til Friday. 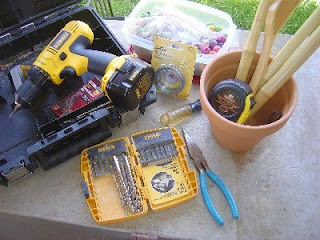 There will be lots of inspiring summer/outdoor and garden projects....giveaways too! Over from Friday Follow. Such a creative project. Makes me wish I had a bigger yard! Fantastic! It has a very cool Zen vibe that will work perfectly with my orchids. Very clear tutorial and a totally clever idea. 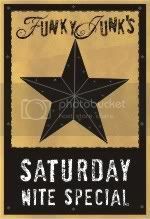 Pop by Rehab and say hi sometime. I'll be back! I really like this bamboo pot hanger, such a great idea. If I had a garden or yard I would totally do this. What a FUN project! Love this. 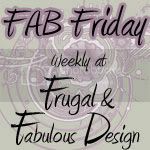 Thanks so much for linking up to Fab Friday this week. Budget Porch Accessories - Look at These! "My Recent Exam" or "She's A Good Egg"
Toe Thong = Fabulous Floss for your Feet!